Click here to buy jewellery gift cards online. Delivered free to anywhere in the world. Redeemable on all our designs and services. Our gift cards make a fantastic gift for every occasion. Available in any multiple of £5 and redeemable against all our jewellery, silverware and services. They really make life easy and gives the recipient the pleasure of coming in to our gallery and workshop to choose something for themselves or by browsing on-line and calling up to order.. A real treat! 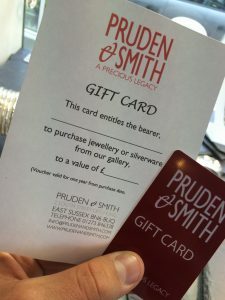 A gift card is great if you are a group of friends or colleagues buying a group gift for a significant birthday, Christmas present, a landmark achievement or a retirement present. Note our jewellery gift cards are bar-coded and electronic so they can be redeemed at any time. If it is lost there is always a record on your account or the recipients account so you cash is protected.